To make the Fried Angel Hair: Ina a deep, heavy frying pan or deep fryer, heat several inches of vegetable oil to a temperature of 375 degrees. Separate the strands of angel hair pasta and very carefully add them to the hot oil, submerging them with a wire skimmer of slotted spoon. Fry the pasta until golden brown, about 30 seconds. Carefully lift if out and transfer to paper towels to drain and cool. When the angel hair is cool, use your fingers to break it up into bite size pieces. To make the Sweet and Sour Dressing: Put all the ingredients except the two oils in a mixing bowl. Using a handheld mixer on slow speed or whisk, stir to blend them. Then, mixing or whisking continuously, slowly pour in the olive and sesame oils, stirring until blended. To make the Grilled Teriyaki Chicken: Preheat a stovetop grill or broiler. In a mixing bowl, stir together the teriyaki sauce, olive oil, garlic, and ginger. Turn the chicken breasts in this marinade and leave them to marinate at room temperature for 10 minutes. Grill or broil the chicken breasts until cooked through, 5 to 6 minutes per side. Chill in the refrigerator, then cut crosswise, into 1/4 inch thick strips. Cover and refrigerate..
To make the Salad: In a large mixing bowl, combine the lettuces, carrots, toasted sesame seeds, cilantro and basil. Add the Fried Angel Hair, 1 cup of scallions, and all but 1/4 cup of dressing. Toss well. Transfer the salad mixture to serving plates. 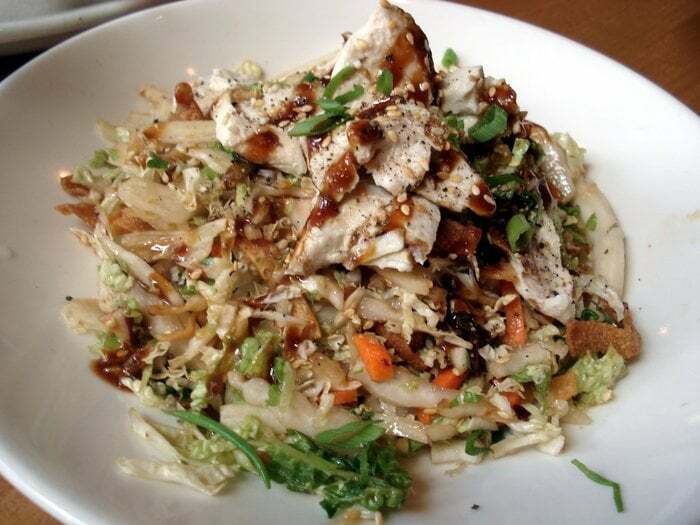 Distribute the Grilled Teriyaki Chicken slices on top of each salad, drizzle with the remaining dressing and garnish with the remaining scallions.